Devil Baby Rolls Into Streets of New York to Promote Film – Mayhem Ensues! To promote the new film, Devil’s Due, the marketing team decided to introduce unsuspecting New York pedestrians to the star of the film via a remote-controlled stroller and the animatronic spawn of Satan. Posted in Baby, demon, Devil, Satan | Comments Off on Devil Baby Rolls Into Streets of New York to Promote Film – Mayhem Ensues! In our article about the other new toddler robot called Roboy we mentioned Diego-san. Here’s your first look into the robotic wagon-train that’s leaving Uncanny Valley slowly but surely. When John Connor shows up and SkyNet goes live it won’t be the T1000s we’re worried about. We’ll be too terrified by something that’s already been here. And you can tear that cute baby robot picture off the wall of your imagination…because robot babies are about as far as you can get from being ‘cute’. Because we’re not satisfied with making skeletal robots that look like mechanical grim reapers, the University of San Diego has created a ridiculously amazing and disturbingly realistic over-sized one-year-old in order to study the cognitive development of infants. As we continue grinning and patting ourselves on the back about our advances in robot technology and march ourselves into our own demise, you can rest assured that the armies of creepy robot babies are just going to keep on smiling that same frightening smile that’ll remind us of ourselves when we were so excited about our accomplishments in robotics. Until then just keep hitting the replay button and shuddering at Diego-san’s facial expressions. 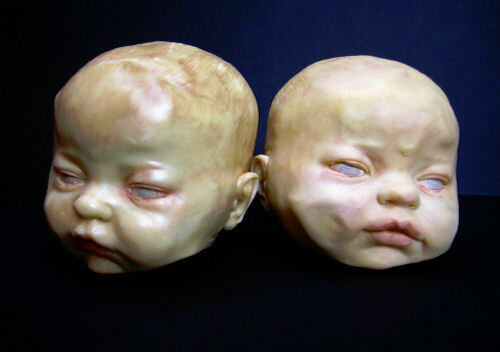 Disturbingly Life-Like Edible Chocolate Baby Heads! A while back we posted an article about a bakery that looked like a franchise from a Saw film where the creative pastry chef decided to create realistic-looking human body parts from, of all things, bread. Edible baby heads made from chocolate. They’re not allowed to let loose the information regarding who commissioned these awesomely amazing, yet disturbing, treats. We’re pretty sure that we’re happier NOT knowing. During a 10 hour surgery, doctors at Mexico City’s La Raza Medical Center removed a 33 pound tumor from 26 pound two-year-old Jesus Gabriel. Gabriel was born with a small, benign lump on his right side that grew faster than he did and extended from his armpit to his hip. Doctors say that this is the first time in Mexican history that the tumor has been larger than its host was successfully removed. Little Jesus is doing fine and making a very strong recovery. Alien Skull Or Bizarre Baby Deforming Tribal Ritual? You Decide! A) Proof that an alien landed in Peru and died in a cave. 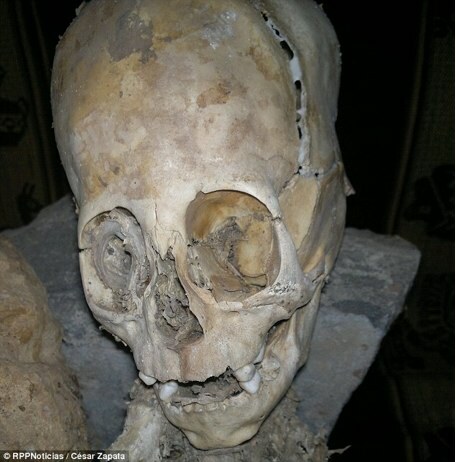 The elongated shape of the skull proves it is not of this earth. Besides it looks like the Crystal Skulls in that Indiana Jones move you’d successfully forgotten about before I reminded you. B) Evidence of a tribal custom of skull elongation. Infants of a certain social standing would have their heads wrapped tightly in a cloth for up to sixth month, creating a sharp conical point. Baby skull reshaping? Alien evidence? YOU DECIDE!